On Wednesday 11th June 2014 the Cambridge Junction hosted the second Cycle of Songs Choir rehearsal. It proved to be another evening of wonderful performances with equally good weather, allowing us to make the most of the sunshine and sing outside. The choir and the public were treated to a pre-rehearsal performance by The Spinney Singers who joined the Cycle of Songs project for a second time, following their involvement at the Museums at Night event on Friday 16th May. They jumped for joy in their red outfits and sang enthusiastically under the leadership of their choir teacher, Arlette Overman, and their pianist, James Ingram. They kicked off the evening, welcoming the Cycle of Songs Choir by singing outside the building. The youngsters were superb, including a premiere of the Hobson’s Choice Round, written especially for Cycle of Songs by the comedian, Dave Cohen, writer for Horrible Histories. They then assisted the crowd and the Cycle of Songs Choir in learning the round, who followed suit and all were soon singing the playful piece that celebrates the Cambridge philanthropist Thomas Hobson & his careful rental of horses, whom Milton the poet immortalized in verse. After the lovely welcome, the Cycle of Songs Choir set-up up in J1 and settled back into the saddle to practice ‘Why We Ride’. With plenty of water on hand, fans switched on, doors open, and the Choir Director, Rowena Whitehead guiding them, the singers were soon in full flow and making great progress. The choir were learning their parts and having fun with the wonderful words that take you around the Cambridge streets, on a tour to the places and feelings of freedom found in cycling. Due to the pleasant weather, the Choir took the opportunity to sing outside as it was a bit packed with about ninety choir members. 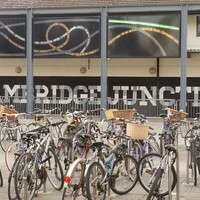 Helen Weinstein suggested a break to sing outside by the bikes – so the singers made their way to the front of the Cambridge Junction for an impromptu performance of “Why We Ride” for the public. It was useful to get a feel for singing outside, and it was a cheery sight to have a large choir singing to audiences flowing in and out of the nearby leisure places. Our next offer, for performers to share their musicianship and love of singing, was that the teen group “Ten Sing” had emailed Helen during the week asking if they could sing to the Cycle of Songs Choir. They set up with the Cycle of Songs banner outside J1, and gave a gutsy performance showcasing remarkable soloists and confident singing outside, setting the bar high for all our singers! Marcus Romer was the next to take his turn at leading at this Cycle of Songs rehearsal by taking the Choir members into the black box space of J1. It was a bit disorientating going from light to dark, but with the performance lights up, Marcus soon started to arrange the singers as if they were in Cambridge market square, learning how to follow the leader and have some fun with body language! The Cambridge Junction provided a wonderful location for the choir to sing, both indoors and outdoors. It proved to be a perfect venue for different groups to share songs with each other and with the public.